Tue., Aug. 2, 2011, 8:33 a.m. FISHING -- A product of cross-breeding turned out to be a big deal for a Pocatello angler. The record-breaking trout Mark Adams caught on July 25 in American Falls Reservoir turns out to be a rainbow-cutthroat hybrid, Idaho Fish and Game Department officials just announced. Agency biologists completed genetic and age analysis on the fish concluding it's the product of a female cutthroat trout mating with a male rainbow. 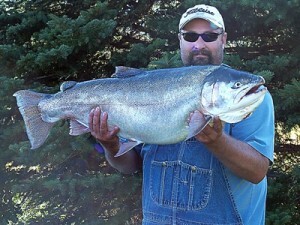 The 6-year-old fish weighed 34.75 pounds, and measured 41 1/8 inches long with a girth of 27 1/8 inches. It was caught on a 10-pound test line with a jig.